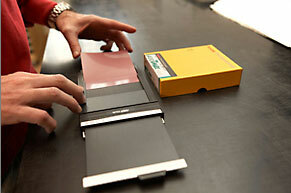 I strongly believe that gelatin silver print still offers much better results than digital print. For this reason I will go on making photographs with the traditional negative film and I will keep making prints on traditional papers until all this will be possible. Moreover to me it is essential the tactile relation, almost a “physical” relation, that I can have with the traditional medium and that it is impossible to have with the digital medium. Photo Daniele Gussago Regarding the negatives, I only use Kodak T-Max 100 and T-Max 400 ASA films that I develop with Kodak T-Max RS. When exposing a negative, in order to measure the lights, I use a spot light meter and follow the principles of the Zone System. What I said about the photographic equipment can also be applied to films: I don´t think that there are ” good” or “bad” negatives. They are all of very good quality, maybe with different nuances, but all yield excellent results. We have to choose only according to our taste and goals. I believe that it is of primary importance to get to know the material we work with by using it for months or better for years. To experiment with new materials is good, but on the other hand too much experimentation can be bad and may generate confusion. Only today, after many years when I have been using exclusively T-Max, I can say that I begin to know it well and that I am able to predict its behaviour in the exposure-development-print process. And we must bear in mind that there are many variables we can apply and they affect significantly the final outcome. For example, we can use a different developer and the result will be different, or we can vary the development time, the type of agitation, the composition of the developer, or make use of a different tool like the tank, the tray, the spinning developer, and so on. 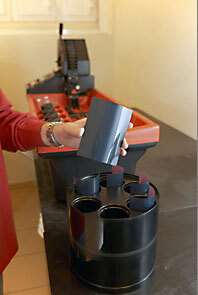 Loading of the negatives into the Jobo drum. Photo Daniele Gussago I wish to underline that printing the negative is the most creative step of the whole photographic process. Instead, when I expose the film, I have to concentrate in order to make a perfect starting point that can give me the maximum and the best information. I have to pay extreme attention when I expose the film, because afterwards, when printing, it is no longer possible to correct a mistake of exposure or a fuzziness or an incongruous composition (and maybe I only have one chance of making this particular photograph), and the printing will be in any case conditioned by what my negative contains.